Hyderabad is a fast growing city in India. Newly developed infrastructures, a fast growing industrial belt have made it one of the most populous cities in the recent years. The city attracts immigrants from all parts of the country now. Apart from growing at a fast pace Hyderabad also suffers from major urbanisation issues. While most of the city is developed and progressing at a fast pace there still remains a considerable population who still live in slums in poor conditions. Some of the concerned issues include poverty, rising population, unemployment, poor public health and education. Poor health conditions have increased the vulnerability of the people to diseases like malaria, dengue, diarrhoea, TB and HIV. 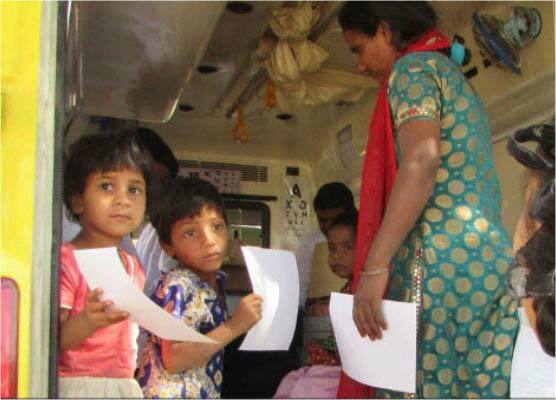 In order to take care of the health care needs of the underprivileged population Smile Foundation intervened and launched a Smile on Wheels project in Hyderabad. The project was initiated with support from United Health Group. Key issues of concerns were found out to be lack of awareness, poor sanitation facilities and no access to proper medical facilities. This is why it was very important to initiate a project that would provide proper medical facilities along with raising awareness too. Children, mothers, daily wage earners are the main focus of this project. 12 health camps were conducted at Balaji Nagar, Saibaba nagar, Nandanavanam, Ews, Indrasenareddy Nagar, Rahmathnagar, Khanametta, Chilkanagar – 1, BS Maqtha, Indira Nagar, Hafeezpet, Vinayaka Nagar, Vinayaka Nagar, Addagutta and Ambernagar. A theme based street play was organized covering a population of around 800 people. To provide primary health care services to underprivileged in the identified villages/slums of Hyderabad through Mobile Medical Unit (MMU). Health awareness (IEC and BCC) activities to generate the demand and promote preventive measures to improve health seeking behaviour. 2828 PATHOLOGICAL TESTS WERE CONDUCTED SO FAR.